What is GamerSusan? 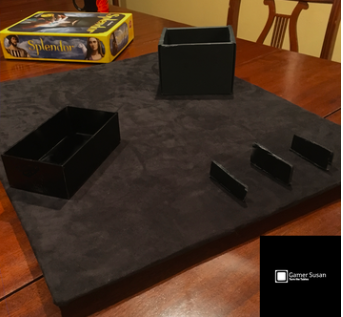 Currently, it is a single product, but the vision is to be a product and community site for board gamers who want to see fun and interesting products that will make their gaming hobby even more enjoyable. Our current product is a deluxe turntable with customizable cloth covers. Board games are undergoing a renaissance! There are so many cool and interesting choices beyond Monopoly and Risk to choose from. 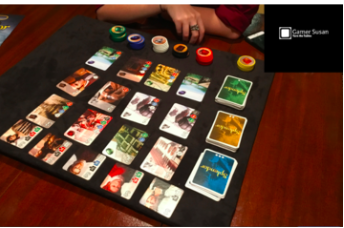 Two of our current favorites are Splendor and Dominion, both require reading of small cards or viewing the board from different angles. Situation: Here’s where you put your heart out. Where are you at? What’s itching you? For me, I wanted to try out some of the ideas in LifeSparcs, and make my board gaming experience better. I wanted also to get a physical product developed, which unlike software, has a tactile presence. There’s something oddly satisfying about creating an object in real space. Possibility: If this thing goes perfectly, what could happen? This is the part you where you dream. For Gamer Susan, I wanted to create the simplest thing I could that I would buy. Something that solves a problem and that is within my grasp to develop. Could I sell something to other people? How hard is that? Actions: Here is where you first list the tasks needed to achieve the Possibility, and then break them down to the week by week basis. Each week for about a year I would choose a few to do to keep the project moving. Initially, the work was around creating prototypes, in cardboard, that I could use with my patient family. Leveraging their feedback I made changes until I found a design I was happy with. I’m learning tons and having fun. I would say making the covers was the hardest part. The second toughest challenge was making the boar d more magnetic. Renewal: With this one, it was challenging so I had to take a few breaks in its production and let the idea sit. I needed seamstresses and somewhere to build the thing, all of which I’m okay with now but need other solutions in the future. I did redo gamersusan.com, letting some of that design work be good enough for now, and leveraging some software that I would normally try to code myself. I needed to be very disciplined with my time in on this project. Coach and Collect: Coaching was big on this one. I have a guy partnering me with marketing and I had some help with the design of the fabric cover. I’m still working on getting some help with manufacturing these things at a lower price point but for now, its quality that I’m prioritizing. It turns out that even the most simple things are challenging to bring to the market. If anyone is a power user of the Alibaba website, let me know! I’ve got some buzz going on social media and looking for feedback on the product to come in. I find it challenging to ask for help, so this has been a growth edge for me. Self-promotion is tough for me, so this next edge, marketing, will be even more challenging. The dividers and cups are held down magnetically – cool! So there it is – using SPARC I was able to bring this thing to life in the midst of a crazy busy life. Let me know if you try the super-simple SPARC method on your next project!